TEB e.V. 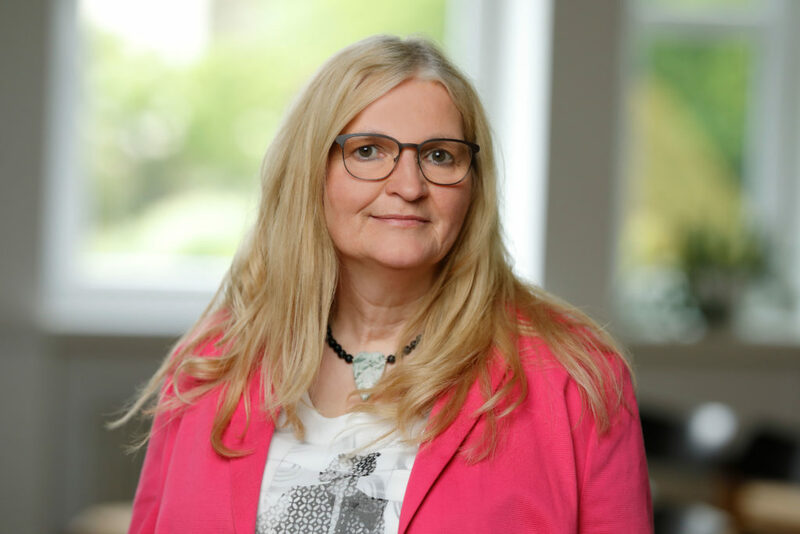 Selbsthilfe was founded by Katharina Stang in 2006 with the aim of providing support to people with pancreatic diseases and their loved ones, as well as education, advice and assistance for their condition. The German acronym “TEB” stands for “Tumors and diseases of the pancreas.” For more than 10 years, Chairwoman Katharina Stang has led the group, which is based in Ludwigsburg but active throughout the country. She works closely with a scientific advisory board of leading German gastroenterologists and oncologists. Helping those affected by pancreatic diseases and their loved ones through personal contact and information is a top priority for Katharina Stang and her team. “We listen – We help – We advise – We accompany – We support”: These guiding principles sum up TEB’s efforts, which are distinguished by a range of offers and initiatives. 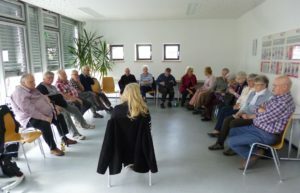 The patient organization’s key activities include regular group meetings, educational events, brochures, counsel sessions for relatives, seminars for doctors and patients, expert medical advice via phone, hospital visits and social activities such as cooking sessions and workshops with those affected. The group also provides multiple materials such as info folders, leaflets and a regularly published member magazine, which nicely complement the TEB websites. Diese Zeile wird automatisch generiert und kann gelöscht werden. World Pancreatic Cancer Coalition Aims to Raise Unprecedented Awareness for a Disease with theLowest Survival Rate of Any Major Cancer Ludwigsburg, 12th May 2016 – The first-ever World Pancreatic Cancer Coalition (WPCC) gathered for its inaugural meeting in Orlando, Fla., on May 11, 2016, bringing together more than 60 individuals representing 40 pancreatic cancer advocacy groups from around the globe. The Coalitions’ goal is to drive transformational change for those affected by pancreatic cancer. “By standing in unison, we hope to save more lives and create a brighter future for the disease with the lowest survival rate of any major cancer,” said Julie Fleshman, JD, MBA, chair of the WPCC and president and CEO of the Pancreatic Cancer Action Network. Three years ago, in 2013, pancreatic cancer patient advocacy organizations from around the world, with founding sponsor Celgene Corporation, began discussions about how best to support each other’s efforts while raising global awareness for the deadly disease. The World Pancreatic Cancer Coalition will oversee the annual World Pancreatic Cancer Day, which was first held in Nov. 2014 and is observed and celebrated from the United States to Europe and from Asia to Australia. November has long been recognized as Pancreatic Cancer Awareness Month. This year, World Pancreatic Cancer Day will be held on Nov. 17. The one-day event aims to raise awareness about the disease, but also to spread the word that with more research funding and more people taking action, pancreatic cancer survival rates can, and will, improve. The World Pancreatic Cancer Coalition has the generous support of corporate sponsors Celgene Corporation, Baxalta Incorporated and Halozyme Therapeutics. For additional information on pancreatic cancer, the World Pancreatic Cancer Coalition and its members, please visit www.worldpancreaticcancercoalition.org. Follow the World Pancreatic Cancer Coalition on Facebook, Twitter and Instagram. member organizations. And each November, Pancreatic Cancer Awareness Month, Coalition members unite on World Pancreatic Cancer Day to draw attention to pancreatic cancer and highlight the need for greater awareness, funding and research. Ferlay J, Soerjomataram I, Ervik M, Dikshit R, Eser S, Mathers C, Rebelo M, Parkin DM, Forman D, Bray,F.GLOBOCAN 2012 v1.0, Cancer Incidence and Mortality Worldwide: IARC CancerBase No. 11 [Internet].Lyon, France: International Agency for Research on Cancer; 2013. Available from: http://globocan.iarc.fr,last accessed 03/14/16. American Cancer Society. Global Cancer Facts & Figures 2nd Edition. Atlanta: American Cancer Society; 2011. After two very active and engaging years, during which TEB e. V. Selbsthilfe had already been participating in an international working group of patient associations in the area of pancreatic cancer, the member associations have decided to make the next step: they will launch the World Pancreatic Cancer Coalition. The coalition will continue the successful cooperation and work initiated by the international working group in order to raise awareness for pancreatic cancer, to represent the patients’ best interests and to enhance research for improved treatment options. The first of the annual planning meetings will take place in Orlando, Florida, in May 2016. In order to support patients with pancreatic cancer in their therapy and help them to tackle the challenges they face in daily life, TEB Selbsthilfe e.V. 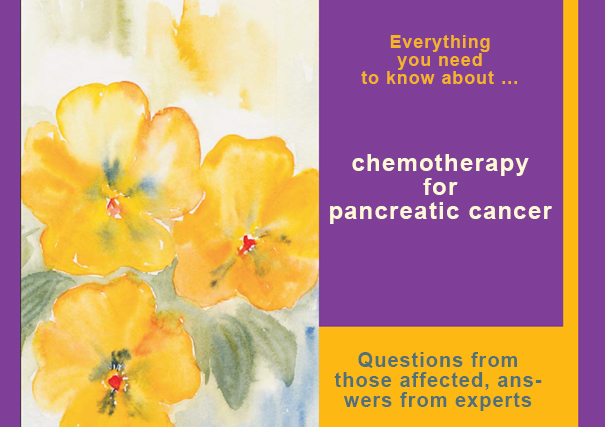 has published the second brochure of its series “That’s what I want to know … Patients ask – experts answer”, which focuses on different aspects related to chemotherapy for patients with pancreatic cancer. The brochure provides detailed and comprehensible information on the topic. Leading experts answer question on a variety of aspects such as potential side effects and their handling, lifestyle adjustments as well as opportunities for psychosocial support. The brochure aims at reducing the fear commonly associated with chemotherapies and encouraging those affected. Currently, 5,000 copies are already printed and can be ordered from TEB e. V. Selbsthilfe e.V. for a nominal charge of 2,00 EUR per copy (plus shipping). Between June 19 and June 21, 2015 the Annual General Assembly of the European Cancer Patient Coalition (ECPC, www.ecpc.org) took place in Brussels under the patronage of Her Royal Highness Princess Astrid of Belgium and the European Parliament. The meeting was chaired by Professor Francesco de Lorenzo from Italy. Katharina Stang, chairwoman of TEB e. V. Selbsthilfe, was personally invited to the event by Mihaela Militaru, director of ECPC. Furthermore, she was asked explicitly to hold a presentation on the importance of nutrition for people with pancreatic cancer during the Annual General Assembly. Katharina Stang was accompanied by Klaus Bibow, member of TEB‘s communications committee. Journey and stay at the conference hotel in Brussels were organised smoothly and took place without any problems. The second meeting day was facilitated by Professor de Lorenzo and started with the presentation of a pan-European patient survey focusing on nutrition. Members of TEB e. V. Selbsthilfe had also participated in this survey. After an insightful introduction by Professor André Van Gossum, head of the department of gastroenterology at Erasmus hospital Brussels, it was time for Katharina Stang to present on the topic of nutrition for people with pancreatic cancer. She delivered a convincing presentation and shared her broad experiences in this complex field with the audience onsite. Unfortunately, time constraints did not allow her to answer questions from the audience directly after her presentation. Many participants complimented Katharina Stang on her speech and she answered various follow-up questions in the subsequent coffee breaks. During the entire event, many participants from different country organisations approached her and asked for additional information as well as for contact details to initiate future collaboration and the exchange of documents and materials. In addition, several participants from other countries, e.g. Denmark and Turkey, invited her personally to working visits abroad. In return, TEB e. V. Selbsthilfe invited them to visit us in Ludwigsburg. During the evening programme, everybody discussed and agreed that this kind of networking is of utmost importance to continue supporting people diagnosed with cancer. Professor de Lorenzo also underlined this when talking to Katharina during dinner by inquiring whether TEB e. V. Selbsthilfe would be open to collaborate with patient groups in the UK. He even offered to get us in contact with them. After many interesting conversations, despite some language barriers, everybody parted inspired by shared experiences and with new ideas for local advocacy work. All participants thanked Mihaela Militaru und Francesco Florindi, the ECPC staff members being in charge of the event onsite, warmly for their perfect organisation. In particular, we would also like to point out that the two interpreters, who translated Katharina Stang’s presentation and facilitated individual talks during the breaks, did a great job and made our event attendance a lot easier. They were a great help, despite many specialised technical terms. We thank them a lot as our event participation would not have been possible without them. The final meeting wrap-up and many individual conversations also made clear that the meeting was a huge success. We are already looking forward to the next meeting, which was announced already. A special thank you also goes to Sandra Wagner, who ensured that our presentation was translated into English and who helped us organising our trip to Brussels. Our attendance at this meeting was another highlight for the work of TEB e.V. Selbsthilfe and demonstrates that we are on the right track. 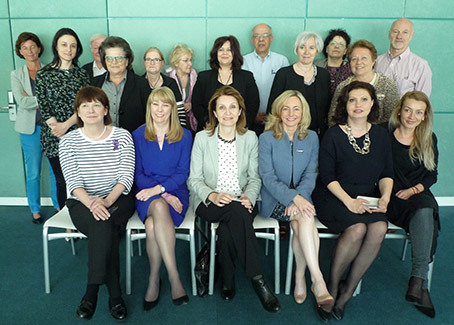 In the middle of April, patient groups from different countries all over the world, which are committed to support people with pancreatic cancer, gathered once again for a working group meeting which provided a great platform to discuss and share insights. This time Prague, the capital city of the Czech Republic, served as the setting for the meeting. TEB e.V. has already been a member of this international working group since 2013. The group, which started with only five member organizations back then, was able to welcome more new members this year. In total, 21 patient organization representatives from twelve different countries, among them Macedonia, Sweden, Great Britain and the USA, attended the meeting in Prague. The agenda covered a variety of different topics – from exchanging individual experiences regarding the various challenges the different groups are facing over patients’ access to clinical trials to planning this year’s World Pancreatic Cancer day on November 13, 2015. TEB e.V. used the opportunity to share insights from Germany and to highlight the specific needs and the special situation of German patients, who have been diagnosed with pancreatic cancer. Especially the patient study on pancreatic diseases, for which we collected data in the years 2010 and 2011, raised a lot of attention. This was not only due to the remarkably high return rate of 80 percent, but also due to the valuable insights we gained from it. For example, other patient group representatives onsite were surprised to learn that in Germany about 80 percent of all patients with pancreatic diseases are actually treated by general practitioners and not a specialist physician. In addition, it became evident that individual patient groups face different challenges regarding the expansion of their network and fulfilling their daily tasks. Being one of the very few organizations worldwide that focuses exclusively on supporting people with pancreatic diseases, TEB e.V. was able to contribute valuable insights and experiences as well as helpful tips from the group’s daily work. Another topic, which was discussed quite lively among the participating patient group representatives, was the enrollment of people with pancreatic cancer in clinical studies – or respectively the question, if and how this could eventually be promoted even further. TEB e.V. stressed the point that – for all decisions to be made with regard to taking part in a clinical trial – the focus always needs to be on the individual patient and his or her needs and that a proper, continuous support of study participants needs to be ensured. 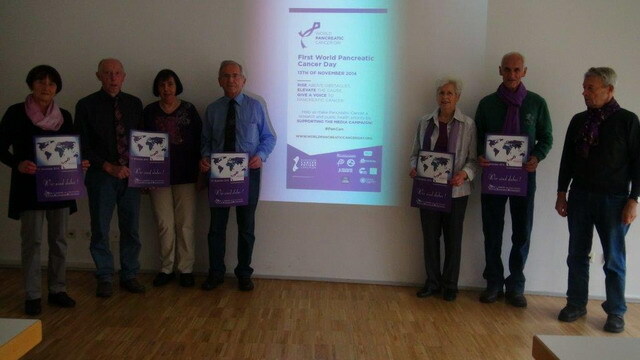 The final point on the agenda was the initial planning for World Pancreatic Cancer Day 2015. After a short recap of last year’s impressive results in the different countries – which included, among others, parliamentary evenings, social media campaigns, country-specific activity videos, light installations which lit up entire buildings in the signal color purple as well as various charity runs – the group started to discuss the most pressing questions around organizing the global awareness day in 2015. As in the previous year, we will celebrate World Pancreatic Cancer Day on November 13. After having achieved great results in 2014, one main goal of the working committee in 2015 is to raise even more global awareness and to collaborate and align more closely in the run-up to the big day. Grouped under one common umbrella theme, which will be published soon, many activities are already being planned in the different countries at the moment. Also TEB e.V. has already started to prepare for the day and will contribute to the global initiative again through a variety of activities. Updates and the latest news regarding World Pancreatic Cancer Day will be published on the TEB websites. Furthermore, the meeting also provided a great opportunity to connect even more closely with other patient groups and to implement further projects together. For example, TEB e.V. 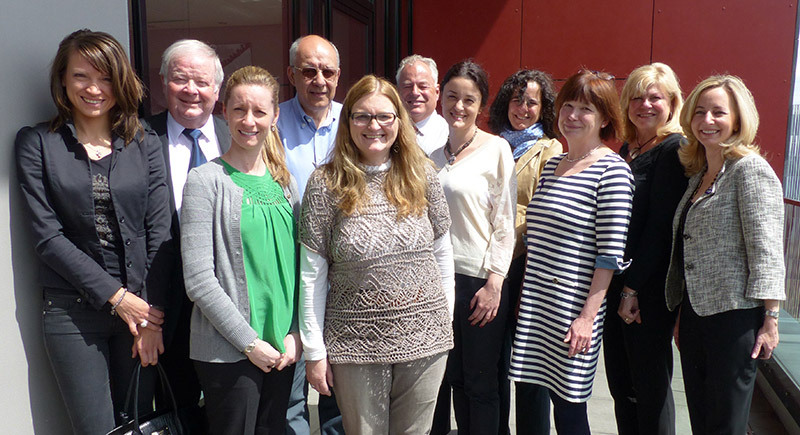 collaborated with the European Cancer Patient Coalition and shared the link to a Pan-European patient survey assessing the importance of nutrition for cancer patients with all of its members at the beginning of May. In my function as chairwoman of TEB, I also accepted the invitation of European Cancer Patient Coalition and will hold a presentation at the European Parliament on the topic of “Nutrition and pancreatic cancer” in the middle of June. The US patient association Pancreatic Cancer Action Network supports the 2nd World Pancreatic Cancer Day as well. The important message of its video: Awareness of this devastating disease is still too low and it continues to claim too many lives. This needs to change! Clara Mackay from the UK patient organization Pancreatic Cancer UK produced a personal video message on the occasion of the 2nd World Pancreatic Cancer Day 2015. Together with other patient groups around the world – including, of course, TEB e.V. from Germany – the organization is committed to improve education and information to tackle this devastating disease. Therefore, here it also says: We take part! Year-end celebration 2014 Regional Group Lauter-Fils! Every year the group members meet to celebrate the conclusion of the year with a little party and a dinner. As in the past, group members and their families took part and their number is growing every year. In a cozy and relaxing atmosphere we dinned, laughed and enjoyed many great and personal, emotional conversations, reflecting on the passing year. We have experienced, overcome and achieved a lot together in 2014 and as always the group members suffering from diseases of the pancreas and their relatives were our focus of attention. The group leader Mr Kistenfeger and Mrs Stang were competent guides revealing and discussing current and interesting new medical advances and treatments related to the different areas of pancreatic diseases, from which all members benefited. Particularly noticeable this year was the number of new patients seeking advice and support in the group. Once again we heartily wish to thank our friend Rüdiger and his wife Frau Ilonka for the wonderful meal that we – as in previous years – all enjoyed very much. Our thanks also go to Mr Bruno Kistenfeger for leading and organizing the group. We thank Röslein for her tasty homemade cakes and hope that we will be able to have some more next year again. Thanks, too, to Beate and Wolfgang Unterlöhner for organizing our group trip to the beautiful Pfalz region. Many thanks also go to Monika for her detailed oral and written reports – we know, no one wants to do this documentation job, but we appreciate this help very much. 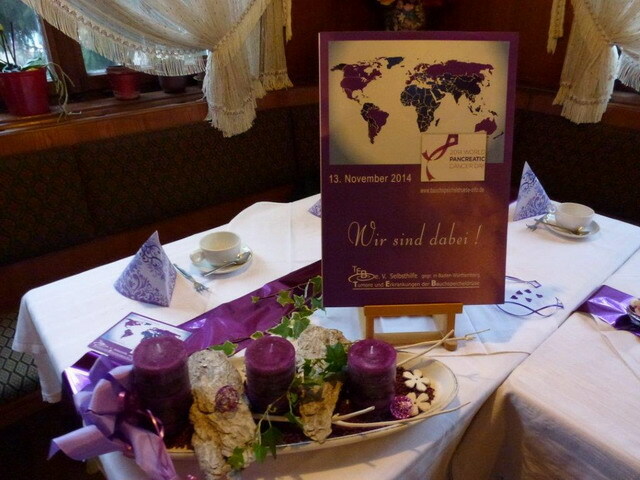 This year we used the first World Pancreatic Cancer Day as a special occasion and decided to set all tables in the respective color, which was chosen for the new awareness day – purple. Everybody was enthusiastic and appreciative of this activity and eager to honor this special day for our members. And everybody supported the motto of TEB e. V. “We’re part of it”. 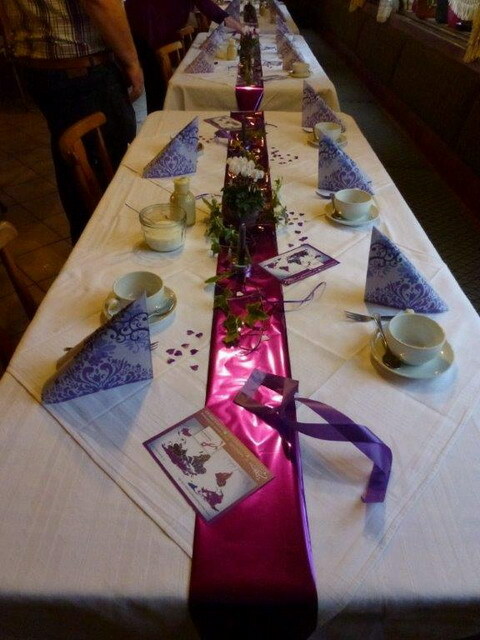 For a long time members have been inquiring about having a special day dedicated to raise awareness of pancreatic diseases. Therefore, I was extremely proud, when I came back from Zurich and was able to announce that the first ever World Pancreatic Cancer Day had been established. It took a while to gather all relevant documents and materials, such as the logo etc., but finally everything was organized a few weeks ago. The group was ready for this day and quickly took all necessary preparatory steps. The first global World Pancreatic Cancer Day is special for us and also for me as the first chairwoman of the TEB e.V. self-help group. We are proud to have taken part in bringing this day to life and that we have been able to contribute our knowledge by participating in the working group from the early days when the idea was born through planning and implementation phase. All members were highly motivated and helped contribute and implement many ideas for this day. We are grateful and happy about the fact that despite the relatively small number of cases we are now even better equipped to raise awareness of pancreatic diseases. All members and their families feel supported, understood and accepted by this day and are optimistic and hopeful that further progress may now be possible resulting from this initiative and that there will be a new focus on enabling a chance for cure in future. My thanks go out to all who helped to make this day such a great success! TEB e. V. is part of it! 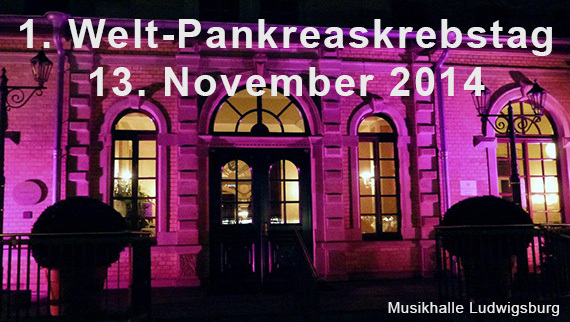 For many years, TEB has been organizing events focusing on pancreatic cancer in the concert hall of Ludwigsburg. In order to raise attention for the first World Pancreatic Cancer Day, there was nothing more obvious than illuminating this beautiful venue in purple light, the colour which has been chosen worldwide to represent the new awareness day. On a big screen we also showed which countries are already participating, which logo is used worldwide for World Pancreatic Cancer Day and how the initiative has been presented in Brussels for the first time. Our goal has and will always be raising awareness of World Pancreatic Cancer Day and educating the public on this serious disease. Certainly, we managed to achieve this with the unique lightning of the concert hall in Ludwigsburg. Many people passing by stopped and simply marvelled. Many of them also asked questions and expressed how much they liked the idea. The founding of a work group focusing on one of the worst forms of cancer can be seen as a great success by many support groups. Much was accomplished in the fields of diagnosis, treatment, therapies and research in the past but often with disappointing results. This newly created initiative, implemented by an international work group (founded in 2012), consists of various patient organisations. In the year of foundation, the "World Pankreatic Cancer Day" was supported by Celgene, a multinational pharmaceutical company that advocates the improvement of life quality of patients. The new worldwide campaign day "World Pancreatic Cancer Day"